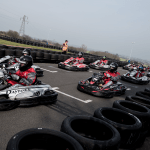 Daytona Tamworth is perfectly situated on the outskirts of Birmingham and offers exciting race events and unrivalled hospitality in the Midlands. Whether you want an exciting team-building occasion for staff members or a fun day out to entertain clients, Daytona delivers. 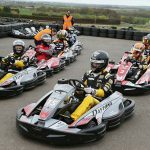 Our superb facilities can comfortably accommodate up to 300 racers with all the karts you require, exclusive use of the track for your booked time and several further activities to suit. All drivers are on track simultaneously. Choose from a 30, 40, 50 or 60 minute race. 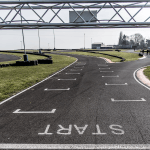 Following a comprehensive driver briefing, your event begins with a short practice in which drivers must warm up, learn the circuit and set their best lap time to determine their starting position for the main race. After gridding up, the start lights switch to green and the drivers race as fast as they can until the chequered flag – with the top three drivers being rewarded with trophies on Podium. Our popular tournament format, with drivers racing in a series of qualifying races which determine their starting position for the finals. We can run up to 30 drivers in each race – but can run heats for very large groups with each driver competing in the same number of races. 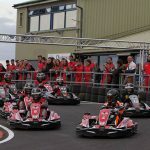 Our computer timing and scoring system awards points to drivers for their finishing positions in the heats and the top point scorers line up on the front row of the grid for the Grand Final. The top three drivers are rewarded with trophies on the podium. Perfect for larger groups, this is the epitome of team building formats. Drivers race in teams – with the objective of completing as many laps as possible in the time allowed. Race lengths start at 1 hour but we can and have staged 12 hour and even 24 hour races! Teams must work together to plan their race strategy and tactics, and must work as a well-oiled unit when it comes to driver changes and refuelling pit stops! All team members initially take their turn to practice and set their best lap in an attempt to clinch pole position for their team. The top three teams receive trophies on the podium.